Since 1995, Gajra Associates - Builders & Developers, a leading Real Estate Firm has been transforming Nashik -Wine Capital of India with styled Apartments, Bungalows, Row Houses and Residential Group Housing Complex. Quality housing delivered at a modest price. 1st Floor, Gajra Chambers, Mumbai-Agra Highway, Kamod Nagar, Nashik. Pathardi – Gaulane Road, Pathardi, Nashik. 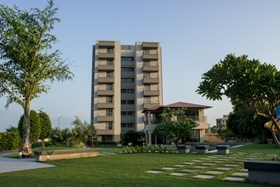 Ready Possession Affordable & Budget 2 BHK and 3 BHK unique Residential Housing Project situated at the Foothills of Pandav Caves with Open Spaces, Amphi theatre, Club House, Children play Area and many more features.